Farewell parties are bittersweet events. People throw such parties so that they can properly say goodbye to friends, colleagues, or family members. Some farewell parties may also be held to surprise the person who is leaving. In either scenario, farewell invitation card designs will need to be meticulously created as part of the party preparation tasks. There are different kinds of invitation cards, and one of them is a farewell party invitation card. This type of invitation card is specifically used for those who are planning a party in commemoration of someone leaving a place or job. But that is sort of a negative way of looking at things. Farewell parties should be considered a celebration of the relationships, the memories, and the life that a person has experienced in a place or among a group of people. Looking at the event that way somehow makes it easier to say goodbye. 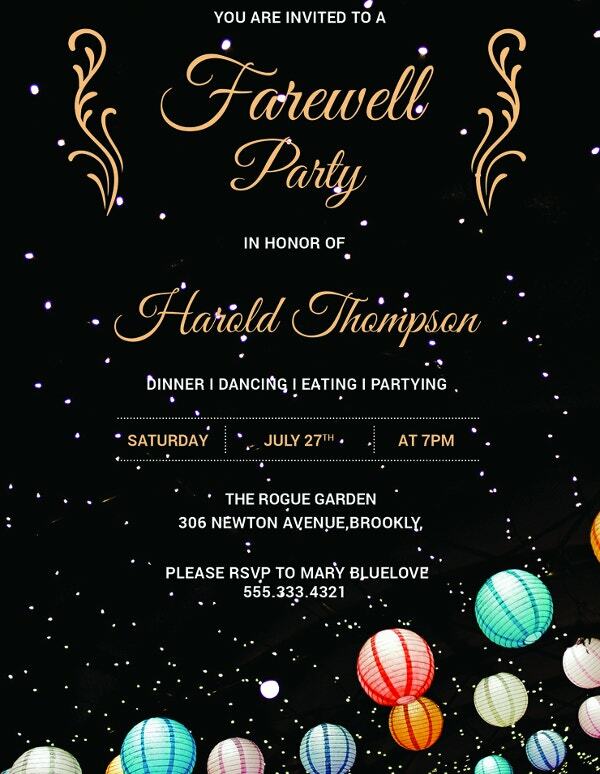 If you are looking for creative farewell invitation designs, you have come to the right corner of the Internet. 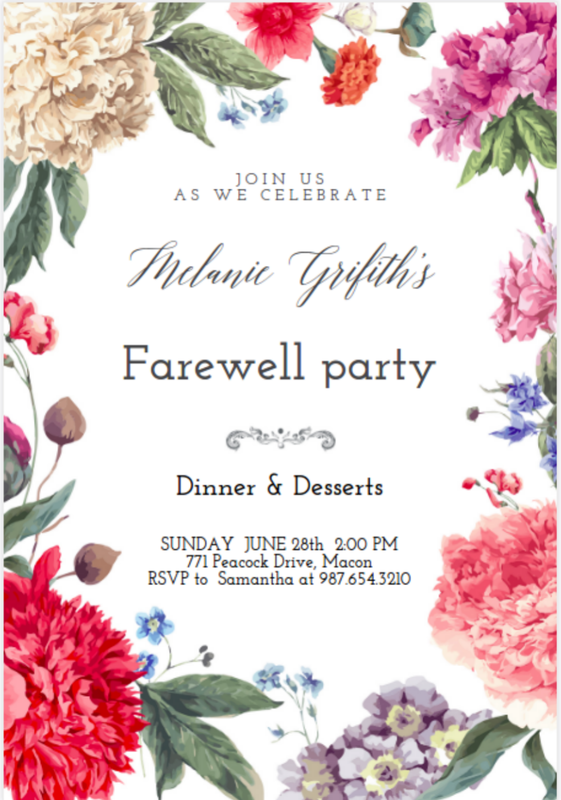 In the next few paragraphs, we will discuss the different aspects of Farewell Party Invitation Card-Making and also provide 10 excellent examples of downloadable farewell invitation designs. Making farewell invitation cards is relatively easy. If you want to create a template-based invitation card, check out the ultimate guide for card-making. It lists the necessary steps that you should take in order to create any type of card design. Or, if you want to exclusively create handmade cards, head over to the How to Create A Handmade Greeting Card Guide. 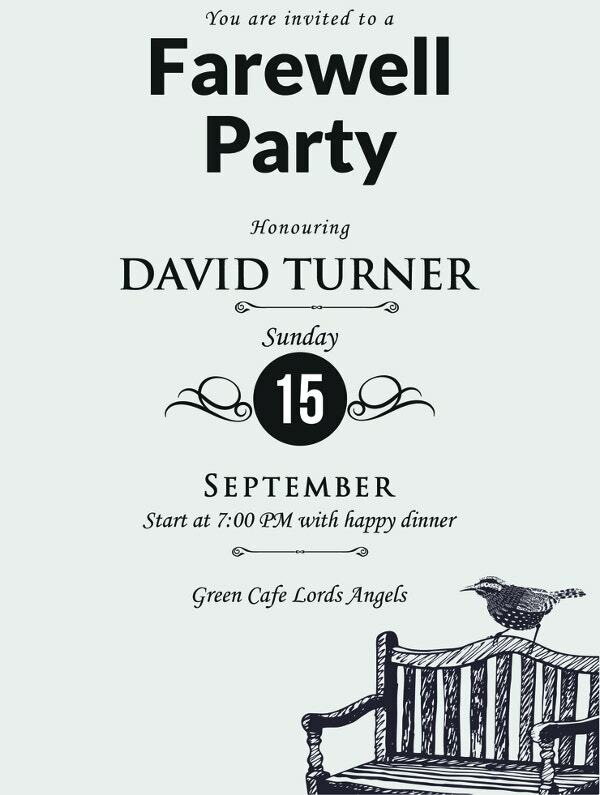 Send party invites at least two to three weeks before the party. In general, party or formal event invitation cards are sent at least two to three weeks before the event. This allows time for the invitees to prepare for the party. Some may need to book flights, file for time off from work, or arrange for babysitters. When planning any party, always remember that people tend to show up for parties more if they have had time to prepare for it. Party planners may also use this lead time in coordinating with the caterer or in planning for the food that will be served at the party. Write party details legibly. Most of those who think about throwing a party may also come up with creative invitation cards. And often, artistic card designs may tend to drown out the necessary party details. To avoid this, always make sure to create a farewell invitation card that will still conspicuously show the main party information. This involves the Who, What, Where, and When of the party. Include RSVP cards. RSVP Cards are not exclusively for rustic wedding invitation cards. In fact, it is recommended to include an RSVP card in all invitation cards. Using this reply card allows party organizers to know the exact number of people who will attend the party or event. If you have received a farewell party invitation card, it is only good manners to reply with a Yes or No using the included RSVP card. Nowadays, some party planners allow invitees to send an email, text, or social media direct message in lieu of an RSVP card. Using this form of sending an RSVP will often depend on the party organizer as this will let them save time and money for printing the RSVP cards. For other more formal events, a printed RSVP card may be preferred. Maintain party secrecy especially if it is a surprise farewell party. 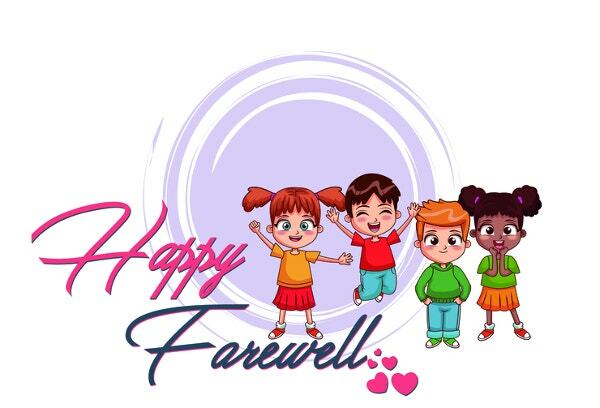 Most farewell parties are planned without the knowledge of the person who is leaving or retiring. If you are organizing this kind of party, it is best to personally inform all attendees to keep the event a secret. As the party organizer, you may also prepare diversionary tactics in case the guest of honor gets a hint that a party is in the works. It is okay to follow card templates. For beginners, creating any form of invitation card may be daunting. 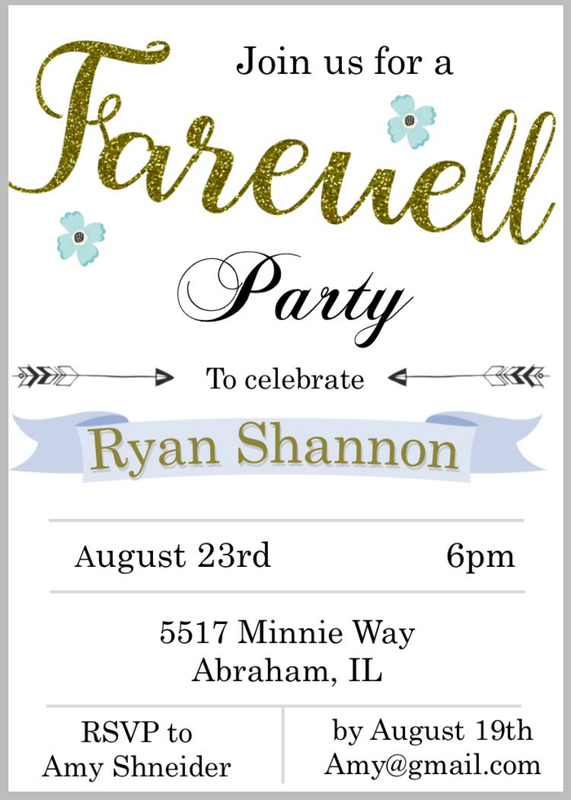 So if you want to try your hand at creating farewell invitation cards, you may need to follow free farewell card templates available online. As long as you customize the templates and transform them for your own party, you will not be committing any card-making gaffe. Gifts are not mandatory. Receiving gifts from party attendees is perfectly all right. After all, you cannot stop other people from doing such things. But what is frowned upon is specifically stating on the invitation card that guests are to bring presents. Besides, farewell parties are not like birthday parties where it is more acceptable to receive gifts. Also remember that you are planning a farewell party. Events like this are meant to be a celebration of your life in that specific place and your relationships with the people you have gotten to know. Spending time with these people (perhaps for the last time) should be enough of a gift to yourself. Include party dress code rules with caution. 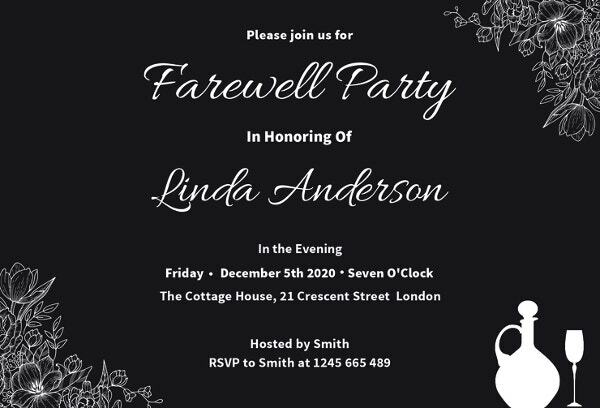 As with the faux pas on including gifting verbiage on a farewell invitation card, a social error may still be committed if you require party guests to adhere to a strict dress code. Rules on party attire may be okay for family members. However, strictly requiring guests to wear something that follows a theme may lessen the probability that they will show up for a party. Guest companions are not recommended. There certainly are other kinds of parties or events where including plus-ones is not considered a social error. However, when planning for a farewell party, it is not recommended to allow plus-ones on the guest list. The reasoning for this is that farewell parties are meant for the guest of honor to enjoy the company of people he or she will miss most after he or she leaves. More often than not, plus-ones may not enjoy the party since everyone present will be focused on spending time with the person who is going to leave. It is acceptable to include guest restrictions on any farewell card template. Thank you cards are optional but highly encouraged. Sending Thank You Cards is something that has fallen out of social custom. However, it is still most welcome especially if you have just thrown a farewell party. In this scenario, the thank you cards that you will send will be another form of communication to help maintain your friendship even if you are leaving. In effect, the cards will be more meaningful. 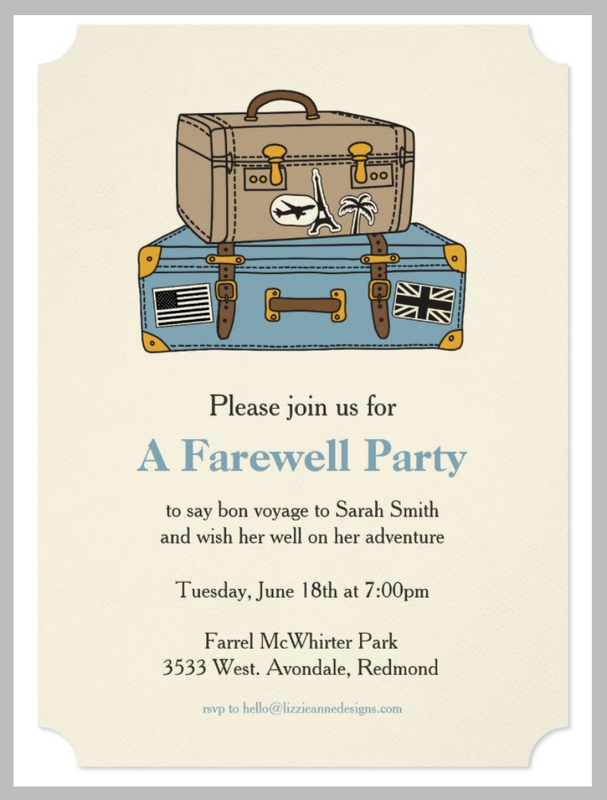 The Vintage Luggage Farewell Party Invitation template design is ideal for low-key farewell parties. The card design is not flamboyant and anyone can recreate it if they want. You may also spice up this card design template by using different types of paper when you print out the cards. 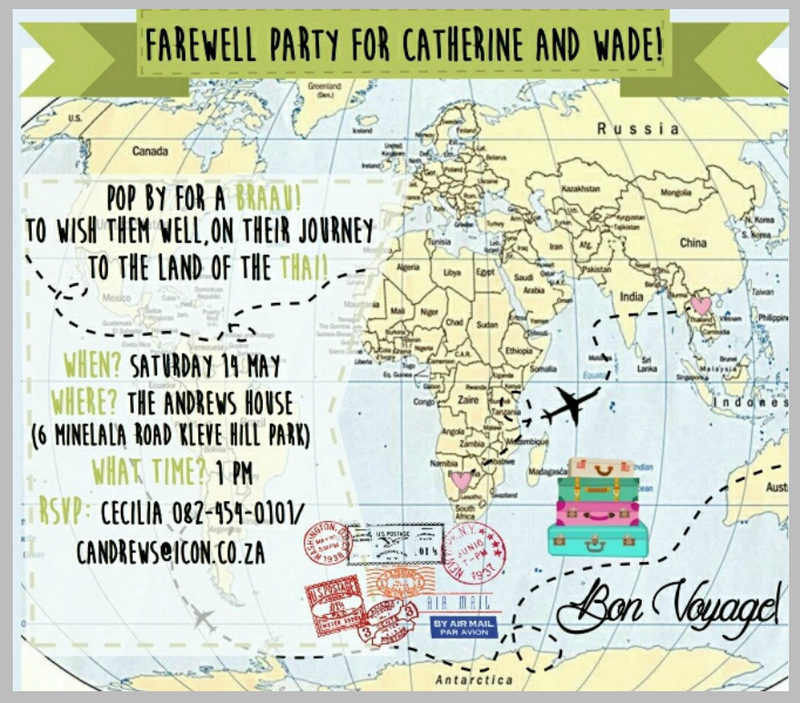 The Flat Map Farewell Invitation Design template pictured above is perfect for those farewell parties held in honor of individuals who are taking a trip around the world. The design features a flat vector of the world map and all the party details can easily be incorporated in the card design. The Watercolor Farewell Party Invitation Design template is best printed on handmade paper so that the watercolor effect will take on a three-dimensional effect. If the party’s guest of honor has an artistic side, using this as an invitation card template will really reflect his personality. Farewell parties are also held for those who are leaving their jobs after reaching the mandatory retirement age. 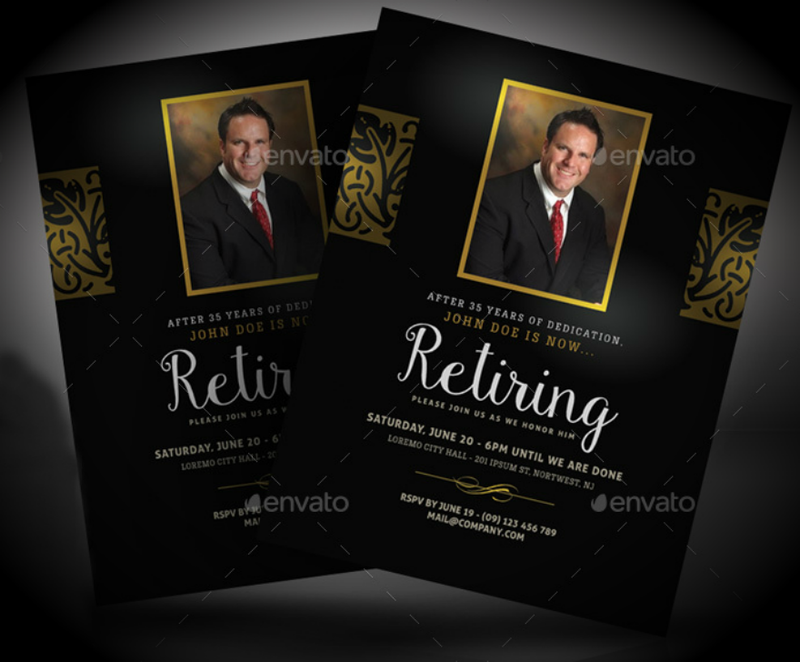 If that is the reason why you are throwing a farewell party, you may use the Retirement Farewell Invitation Design Template pictured above. The card design is fully customizable and you can change the picture to match your party’s guest of honor. 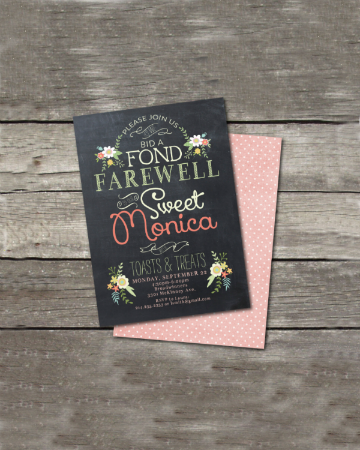 If you want a cool invitation card template, you may use the Chalkboard Farewell Invitation Design template. As with all templates, this card design can be fully edited to match your own party details. As with all chalkboard designs, this card template is best printed on dark colored paper. Farewell parties are often held for those who leave their jobs, schools, or residences in order to pursue a different job in another location. The separation may be temporary or permanent. The Post Card Farewell Party Invitation Design embedded above shows that people may still communicate through other ways like letter sending or through social media. Using the card template above will help spread the message and perhaps even help your circle of friends cope well with your leaving. Not all goodbyes are sad. 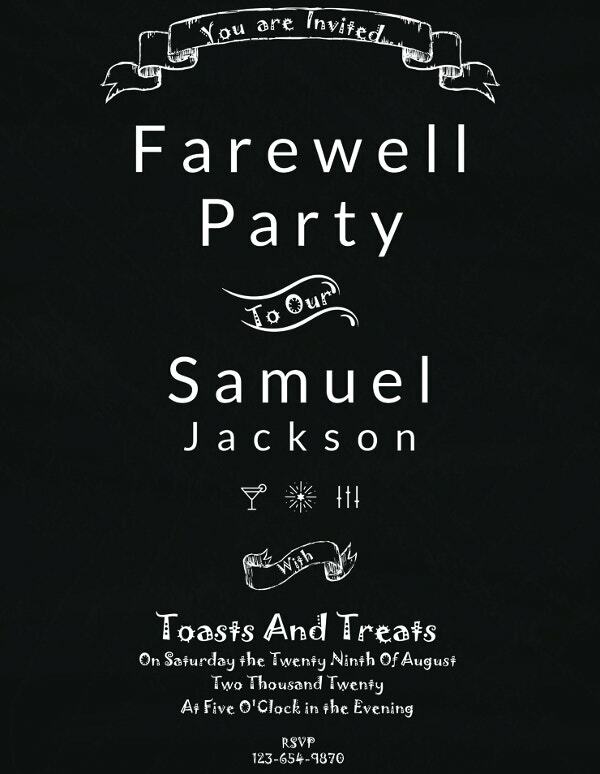 The Farewell Party Invitation card design featured above is an example of that. The invitation card template is worded like someone is going off to an adventure that will surely change his or her life. The card design’s main color scheme also exudes cheerfulness. Using invitation cards like this may also help ease the anxiety of parents whose children are leaving home for the first time. Treat the 10 different farewell invitation card designs featured above as the groundwork for your own card designs. Use the design principles that you find effective and appealing. This way, you will be able to create truly original card designs.